After the conquest of Belgrade by the Turks in 1521, Sephardic Jews quickly supplanted in number the Ashkenazic community that had arrived before them, from Hungary in particular. Loyal Turkish subjects, Belgrade’s Jews enjoyed an initial phase of relative prosperity, transforming the city into one of the premier Sephardic centers in the Balkans. The Belgrade yeshiva was known throughout Europe, thanks to the reputation of rabbis like Meir Andel, Yehuda Lerma, and Simha ha-Kohen, who had to public their books abroad, lacking a suitable printing press at home. The Jews suffered, however, at regular intervals during the Austro-Turkish wars, repeated assaults on the city in the seventeenth and eighteenth centuries. When the Austrians seized Belgrade in 1688, they sacked the Jewish quarter of Dorçol and captured a portion of its residents, forcing their fellow believers to buy them back. The city’s great Sephardic rabbi, Joseph Almoslino, counted among the victims. This did not prevent the Turks, in their turn, from reproaching the Jews for failing to retreat with them, unleashing a new wave of persecutions. The Jews later tied their fate in large part to that of Serbia’s movement for national emancipation, supplying the insurgents with arms and munitions during the anti-Turkish revolt of 1815. Thus, in 1830, when the sultan agreed to a statute providing autonomy to Prince Milos Obrenovic’s Serbia, they were granted civil rights equal to those of other citizens. Many Jews joined the ranks of the new Serbian state, most notably the army, where they formed the prince’s personal guard, while one of them, Joseph Slezinger, directed the military orchestra. The prince authorized as well the printing of books in Hebrew in Judezmo. The community’s status noticeably began to erode under the reign of Prince Mihajlo Obrenovic, who succeeded his father in 1839. A scandal involving ritualistic crimes contrived by anti-Semitic circles exploded in 1841. A pogrom took place in the fortress city of Sabac in 1865. It was only after the Congress of Berlin in 1878, which required all the Balkan states to grant complete equality to all ethnic and national minorities, that the Jewish community began to grow and prosper here, especially in Belgrade. The historic district of Jalija and Dorçol, on the banks of the Danube, soon became too cramped: while the Ashkenazic community began settling the banks of the Sava River, the Sephardic population climbed the hill up to Prince Mihajlova Street and Terazje Square, where they opened some of the city’s most beautiful shops at the turn of the century. Religious institutions and buildings remained in Dorçol, however, a quarter which, before the Shoah itself, would be largely destroyed during the terrible bombardment of Belgrade by the Luftwaffe in April 1941. This is why there remains little trace of Jewish life in Belgrade, with Jews numbering around 2000 before the war in Kosovo in 1999. 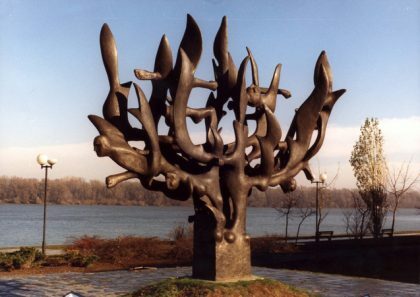 In Dorçol, a monument to the memory of the Jewish community was recently put up on the bank of the Danube by Jewish sculptor Nandor Glid. The Jewish Historical Museum presents a history of Jewish life throughout the former Yugoslavia, with a collection of religious objects, clothing typical of the country’s Jewish communities, and photographs. Of the three synagogues in Belgrade before the war, only one still serves as a house of worship. Built in 1926, it was transformed into a military brothel by the Nazis and rehabilitated after the war with German reparation money. The city’s largest synagogue, erected in 1908, was destroyed by the Germans in 1944. A commemorative plaque has been placed at the site (Cara Urosa 20), where a museum with no particular relationship to Judaism now sits. The Jewish cemetery contains most notably an impressive monument to the victims of the Shoah and the Jewish combatants during the Balkan Wars (1912-13) and the First World War. It was in splendid Kalemegdan Park, between the Sava and the Danube, that Moshe Pijade, the most famous Jewish Communist poet of the Tito era, was buried in 1957. Yugoslavian Communist Party pioneer in the 1920s, Pijade was one of the principal collaborators with the future Marshal Tito during the Resistance. After the war, Pijade in particular arranged the departure to Palestine of 6000 of the 14000 Yugoslavian Jews who had survived the genocide, before obtaining the post of National Assembly president.